The Khan AIMO represents a gaming first with its exclusive Hi-Res audio compatible surround sound. Adding a top-end virtual 7.1 headset to the AIMO series, it boasts a premium hardware spec with its powerful driver units and built-in high fidelity sound card. As impressive structurally as it is in terms of performance, the Khan AIMO's stainless steel sliders provide incredible robustness yet with remarkably low weight at only 275 grams. Together with its memory foam earpads, this makes it a headset suitable for use over extended periods of time. The Khan AIMO is comfort. Surrounded. 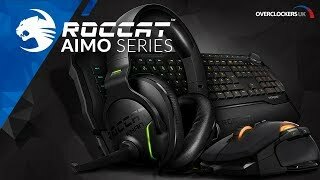 More links for "Khan Aimo 7.1 Hi Res RGB Gaming Headset, Black (ROC-14-800)"